Jason Calacanis, formerly of Weblogs, Inc. and more recently an Entrepreneur in Action at Sequoia Capital, will launch his newest startup, Mahalo, this afternoon at 3 PS PST. The site is password protected until then. Mahalo is a search engine, and will join Powerset as the more interesting new engines to launch in 2007. The service has features that are similar to the new Netscape news finder product that Calacanis launched last year at AOL: expert guides will determine the most relevant results. 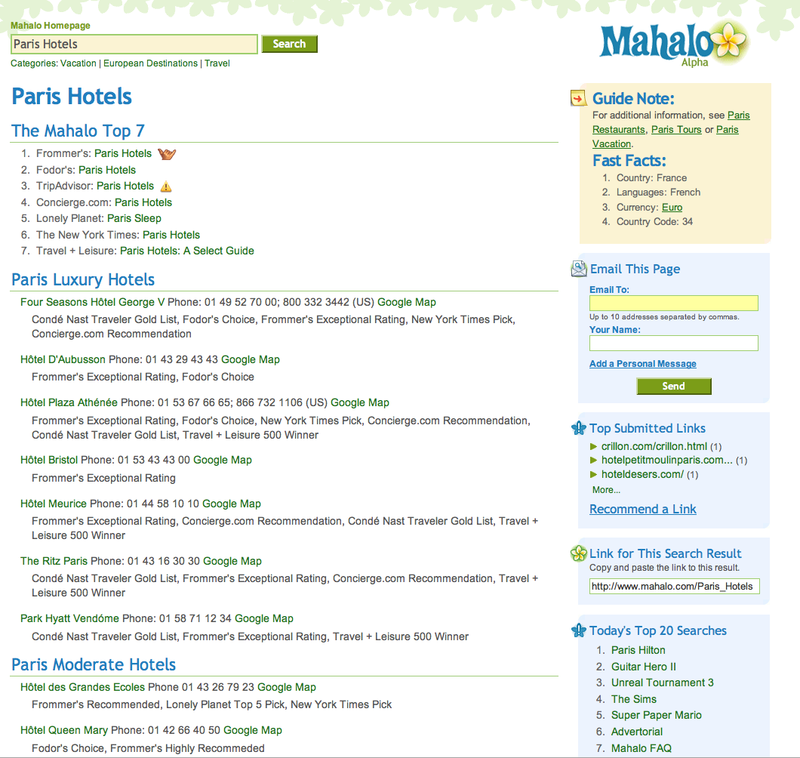 The main search results are provided by guides (Mahalo employees), who find relevant results for search terms. User submitted results are also included. The primary results for search terms are included at the top, in a “top seven” area. These are hand picked results from the guids that should all be good results for the query (see screen shot below of results for “Paris Hotels” – click for larger view). To the right of the results are “Guide Notes” which include additional information including relevant additional searches and “Fast Facts.” In the case of Paris Hotels, the “Fast Facts” include the country, language, currenty and telephone country code. Additional hand picked results appear below the Top Seven, and Google results round out the query. Also in the right sidebar is a place for users who’ve registered with the site to submit links relevant to the query. The more users who’ve submitted a unique link, the higher it appears on the list. Mahalo will be looking for fraud in this area – if a guide determines a link to be spammy, they will ban the link, the user and the user’s IP address “forever.” However, if a link gets enough votes and is determined to be relevant by the guides, it will move over into the main search results area. Each search page also has a discussion/forum area, where any registered user can add their thoughts to what’s included on the results page. Mahalo has 40 full time guides today and have created 4,000 results pages – each of which will serve approximately 12 various queries. Calacanis says that the guides are steadily improving results and adding more queries – they expect to have 10,000 by end of year, and 25,000 by end of 2008. They are really focusing on top search terms, which they obtain from a number of search engines and other sources, Calacanis says. If a user makes a query that has no Mahalo results, they are given Google results instead. Calacanis stressed that it is going to take them a couple of years to get really deep results for most queries – until the end of 2007 the site will be in Alpha, and will be in beta for all of 2008. “It takes a few years to build a really compelling search engine,” he said. Mahalo has now completed two rounds of financing. The first was led by Sequoia Capital. The second was led by Elon Musk and News Corp. The size of the rounds have not been disclosed, but Calacanis says he has enough capital to run the business for up to four years without revenue. Disclosure: We have no financial interest in Mahalo; however, Jason Calacanis is our partner on our upcoming TechCrunch20 Conference.